A range is any rectangular area of the spreadsheet. It can contain parts any number of rows and parts of any number of columns, providing its shape is rectangular. 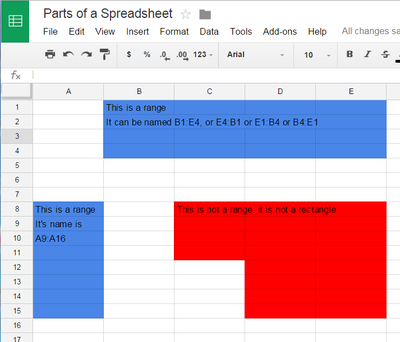 TIP: Always use the format commands in a spreadsheet to add formatting to your numbers. Avoid typing in the dollar signs, percent signs etc. You will avoid some potential problems with some of your data entry. A literal is a string, a collection of letters numbers and special characters. Strings however do have their own set of operators and functions that can operate on them. The first character of a formula is the equal sign = followed by any number of operators, functions and cell address. 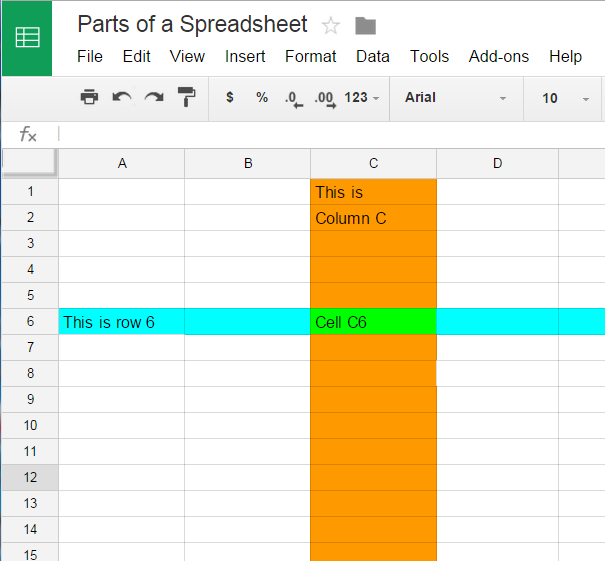 A function is built in to the spreadsheet. By default, cell addresses are relative. The user must modify a cell's address to make it an absolute cell address. When entering a cell's address, the F4 function key will cycle through all possible absolute cell addresses for the cell.